Well, we're settling in here for the long (LONG...did I say long?) winter season. 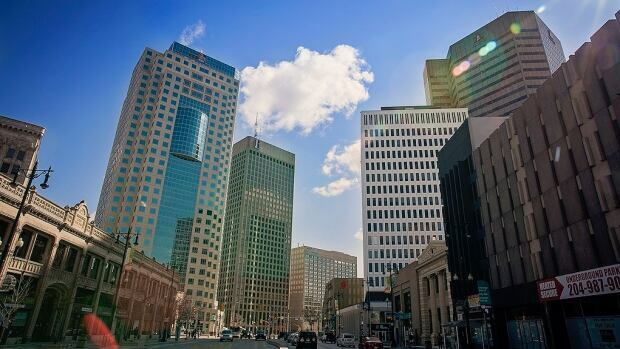 I think I'm still not over last year's winter, it was the worst in 118 years of recorded temperatures in Winnipeg. It was -11F (-23C) when I last looked at the temperature this morning, with a windchill of -25F (-31C). Last night, as our professor was driving home through rush hour, we had a little snowfall. Only around 2 cm, less than an inch, but enough to make driving home in the dark more of an adventure. This morning as we got the boys out to the car for preschool, one of the dudes insisted on playing with snow with his mitts on. I just instituted the "double mitts" one needs for this weather (one handknit mitt inside of another one, on each hand) and of course, they aren't used to getting them on and off. Imagine wearing a coat with a liner--you put the whole thing on at once and do not peel off the liner each time...there, that's a double mitt! 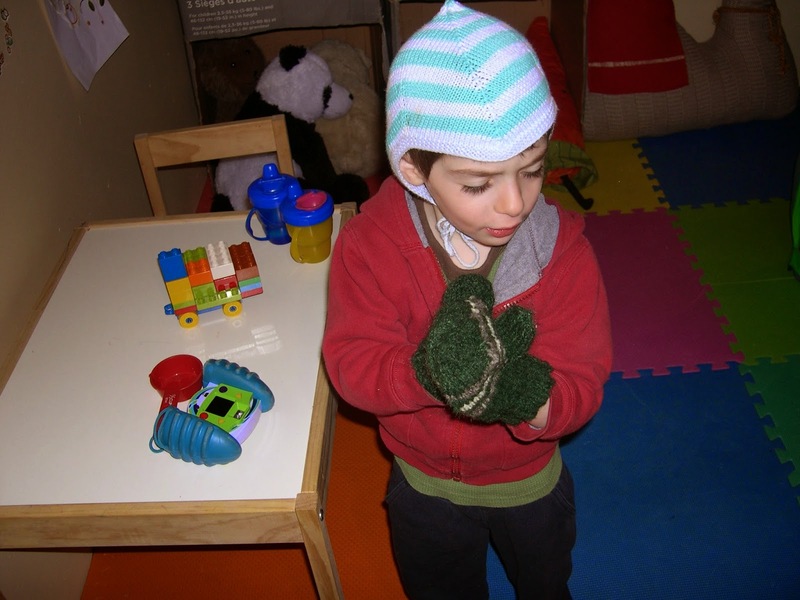 Of course, said twin has not learned yet that snow play will make your hand colder, particularly if your mitt comes off. (insert kid screaming "PUT MY MITT BACK ON! Help me with my mitt! COLD! COLD!" 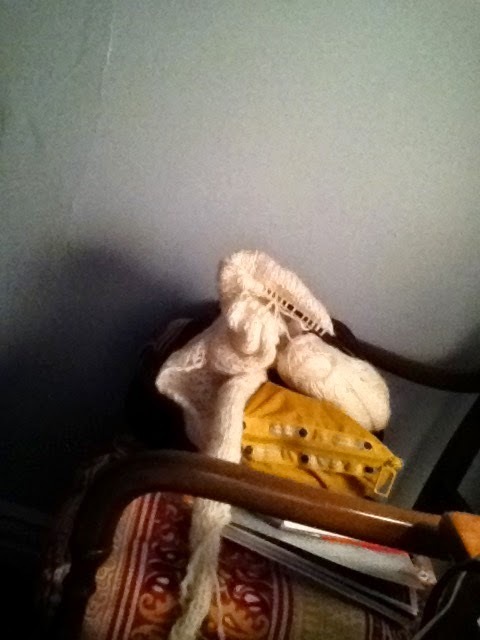 for the third time, which means a parent has to take her mitt off to fix the problem again.) Sigh. It's a learning process. A while back I promised my bread machine whole grain bread recipe. I'll offer it (with variation) below. My whole thrust is to produce a healthy homemade bread without extraneous preservatives or other "stuff" in it--and have it be as time efficient as possible, so I can manage to make it consistently as our "house bread." Making homemade bread tastes better, saves lots of money, and is probably better for you, but it does take time. This new bread machine system takes all the joy of hand kneading and "making the bread" away, which I miss, but it reaches all the other goals, so for now, it's the machine..
NOTES: If you like a really crusty loaf, set it on Dark crust, and if that is not crusty enough, preheat your oven (Convection Oven, if you have it) at 425F. When the bread comes out of the bread machine, pop it out onto a cookie sheet and put it in the oven for 15 minutes. VARIATION FOR 3 YEAR OLDS! The above recipe was "too dark" and "too crusty" to be really popular among twins in our household, despite the white flour. I was annoyed; the grown-ups liked it! Here's the variation--still lots of whole grain, still good for you. ---I'm still having some tummy problems, so I mostly eat spelt bread, which I make differently. I will save that recipe for another time. It's full-on winter here. Windchills of -20C (-4F) and blowing snow. Yup. Happened pretty fast, actually. We've all got a virus, complete with sniffles and coughing and general sore grouchiness, so we weren't outside this weekend. We skipped our dance class and mostly played in the basement. Every year I try to produce at least one pair of fancy mitts in colors that my twins want to wear. 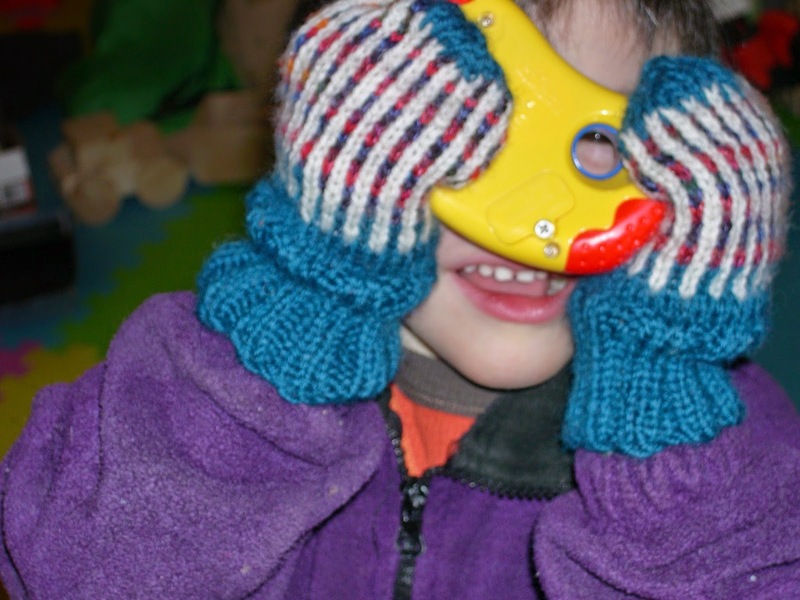 To clarify, every kid has to have at least 2 pair of mitts, so one set can dry out, if necessary, or when it is really cold, so we can double up the mitts. 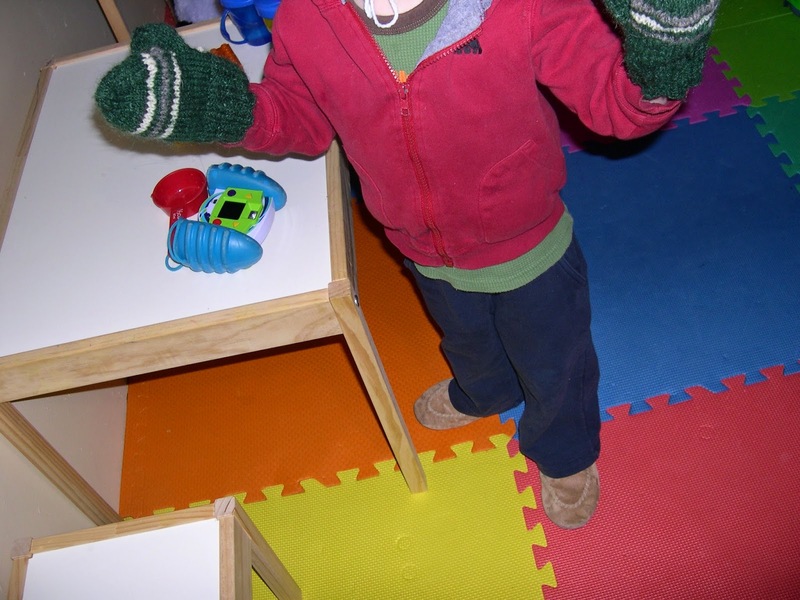 Until this year, we had some wool handknit sock/mitts which we just rotated onto feet and hands as necessary, but the boys are beginning to get why we have thumbs in mittens, so that won't last much longer! This year I was running a bit late. I finished my second pair yesterday and we had our photo session. Both boys got their cameras out to shoot photos, and we were off to the races! Note in the first photo--we were checking out the inside of one of the mitts, as it's just as colorful and "beautiful" as the outside. (that multicolor yarn is Mountain Colors Twizzle and it meets the requirements of the twin who wanted blue, purple, red, yellow, green...etc.) Contrast colors are the leftovers of blue yarn I used for the Wrap-Around Cardigan design and some lovely plain old natural yarn from Catherine Friend's farm. These mitts are special for different reasons. I dyed the green wool myself from beast roving, which is a wool/mohair blend that is reclaimed from the machines that produce Brown Sheep yarn in Nebraska. 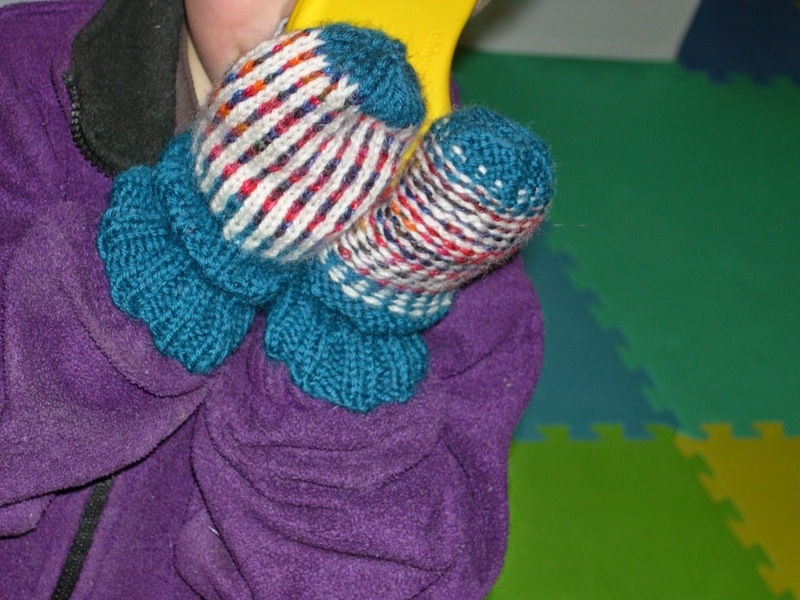 All the yarn for these mittens was produced on spindles, plied on spindles, and then knit up--while chasing twins. So, all this past summer, when I was standing around in the yard while we played at the sandbox, I was spindling. I made mitts to order. Green, to match this kid's coat, with a gray natural colored Shetland stripe from our friend Margaret's (& Linda, but he doesn't remember Linda's) sheep. I threw in a white stripe of some random handspun I had, which he does not seem to mind, but having Margaret's Shetland wool in the mitts was deemed very important to this kid. It takes me forever to make anything these days but making kids' mitts (size 4, in case you want to do a pair or two for us!?) is very quick. We have these two pair, and a couple pair our Didi made with matching winter hats (Didi = my mom) and we're very nearly set for real winter. We've got something like 10 or 11 handknit sweaters that currently fit us, so between my needles and my mom's, I think we've got that covered. Yes, it gets cold here. I cope with my obsessive worries about being warm enough for winter...by knitting more. Sadly, it is now too cold for me to knit in the parking lot before preschool pick up, though! Enjoy the photo shoot! As soon as we stop sniffling, (come spring?!) we might want to smile again, too. I'm really proud to have an opinion piece up at the CBC! It was posted online late Friday afternoon, so not many people saw it before it just became part of another news cycle. What I meant about gaining grassroots involvement in Winnipeg is not that everybody go out and fix the potholes themselves. However, my hope is that educated and intelligent people try to help fix city problems by offering city officials suggestions, help and expertise rather than throw up their hands after electing these folks to political office. Stay warm...it's woolly weather now. For all my knitting, weaving, spinning,crocheting (etc) readers, check out this cool website, Wovember, for more warmth and fibery goodness this month.